Many dogs are anxious or nervous around children. Kids are unpredictable, grab without warning, move faster than adults and make a high pitch scream that usually provokes a response in dogs. In fact, screaming with a high pitch and running away (which is what many kids do when they don’t have experience with puppies) is very attractive to puppies and usually results in the puppy chasing the kid. That’s why early socialization with kids of varying ages is so important. I had platoon on making it a priority for Quest to meet a number of kids of all ages, sizes and shapes. Because Im single with no kids, I headed over to my brother Jim’s house so I could introduce Quest to his four kids; Anna, Nora, Maggie and Eddie. Now meeting a group of kids can prove to be overwhelming, so I asked my brother if we could have the kids come out one at a time. He went into the house to let the kids know which gave Quest a chance to sniff around a bit in the yard and get his bearings. As a general rule, giving the puppy a few minutes to sniff around alone before introducing it to new people or animals is always a good idea. First up was my niece Maggie. Maggie did a great job of moving slower and not grabbing him. Many kids want to pick up and hold or hug a puppy. I can’t say I blame them, puppies are awfully cute. However, most dogs are not fans of hugs and puppies often will nip as a way of disagreeing instead of moving away. Next up was Maggie’s twin sister Nora. Nora is pretty active and as you can see in the above video, she wanted to pick Quest up multiple times. I knew Quest would be ok with this so I didnt object. But if your puppy starts wiggling or looks uncomfortable, maybe just have them stick with petting him / her. Also keep in mind that dangling hair, strings, ribbons, untied shoelaces etc are pretty hard for a puppy to resist chewing on. Pulling hair back, tying things up or removing any dangles can help your puppy stay out of trouble when meeting kids. Because of how quickly dogs grow, it wont be long before Quest is too big for Nora to pick him up and hold / hug him anyway. My brother’s oldest child Anna and their son Eddie were gone when I first arrived, but just as we wrapped up Nora and Quest’s meeting, they returned home. Eddie and Anna took turns meeting little Quest. Id recommend keeping the early meetings to human / canine interactions at first. Eddie wanted to get him a bone, but for young puppies Quest’s age, human interactions are more interesting and beneficial. Also for smaller kids, if they HAVE to hold the pup, try asking them to sit down to do so. That way if they drop the pup, its not a long fall. After introducing Quest to the kids individually, it was time for some group play. This was a great way to kick off Quest’s socialization around children. The kids were very well behaved (good parenting there Jim and Emily), polite and took direction well. 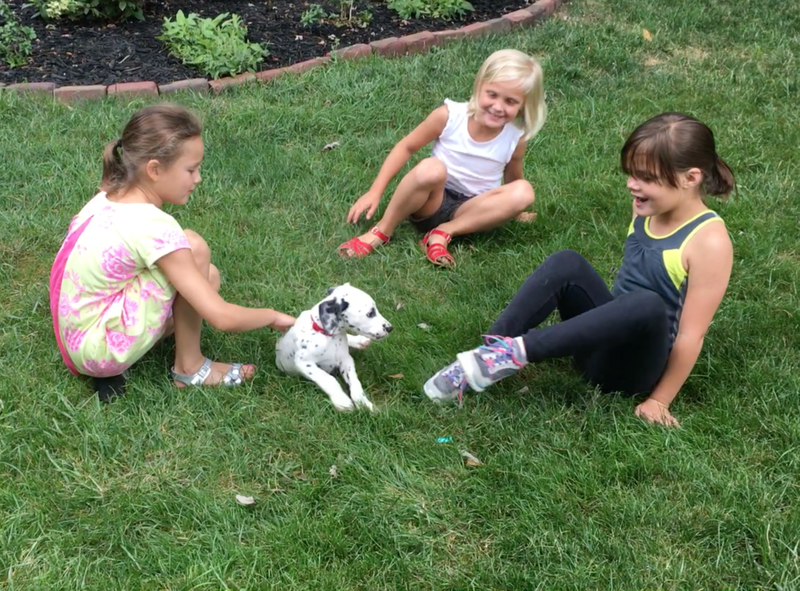 Id look for children with similar dispositions and behavior for your pup’s first meeting. But keep in mind, kids of different ages act differently so don’t assume one group of kids is sufficient. As I detailed on the Critical Socialization Checklist on this page, meeting kids of different ages, sizes, personalities and energy levels are all important. Even the occasional mischievous child can be beneficial – just be sure to intercede if things don’t look like they are going in a good direction. Much better to pull the plug early and try again another time. Remember, bad experiences during the Critical Socialization Period can stick with a dog so make sure its a good and positive experience every time.